The organic spice market is anticipated to depict an upward trend in the ensuing years, primarily owing to the growth in F&B industry along with rising consumer awareness regarding the health benefits and medicinal properties linked with organic spice consumption. As per Global Market Insights Inc., the overall organic spice market held a valuation of USD 20 billion in the year 2017 and is projected to register a CAGR of 7.5% over 2018-2024, aided by the transition in terms of preference from chemical-based to chemical-free spices. Apparently, this shift is backed by noteworthy health benefits including anti-inflammatory and pain-relief properties of the naturally cultivated spices. The product spectrum of this business space is flooded with an array of organic spices widely used across the globe, including chilli, ginger, garlic, turmeric, coriander/cilantro, and nutmeg & mace. Indeed, each spice boasts an exclusive aroma & taste which makes it unique to be used for preserving, flavoring, garnishing, and coloring food. For instance, chilli, belongs to the capsicum family and has profoundly been used in cooking since the advent of civilization. Chilli is most widely used in Indian, Asian, and South American cuisines, stimulating an extra dimension of spiciness and flavor to almost any savory dish. Considering the global expanse and broad application spectrum of the natural spice products, it is rather overt that the organic spice market would voyage along a lucrative growth path in the imminent future. Garlic is a popularly used spice across the globe and belongs to the onion family. Indeed, garlic is associated with a host of medicinal properties and health benefits, such as the ability to cure cough, combat allergies, inhibit cancer, reduce weight, and lower high blood pressure. The spice is also popular for reducing stress symptoms, reducing arthritis pain, aiding metabolism, lowering sugar level, and reducing cholesterol level. Apart from its gamut of medicinal properties, garlic boasts of sharp flavors which surge aroma as well as taste. This has substantially strengthened its application spectrum – the product is used massively in meat products and ready-to-eat packages, the widespread deployment of which will eventually boost garlic-based organic spice market share. Incidentally, garlic-based organic spice market size will be pegged over 2.5 million tons in terms of volume by 2024. Turmeric has been positioned in spice cabinets for ages, as it is a complete health booster, extending benefits for the heart, skin, digestion, pain relief, and much more. Turmeric is laden with curcumin, a compound which offers splendid anti-inflammatory properties to this natural spice. Given that heart diseases occur mostly due to chronic inflammation, consuming turmeric as an anti-inflammatory agent can help prevent heart diseases and heart attacks, which is a leading cause of deaths worldwide. As per estimates, the global curcumin market is projected to exceed USD 100 million by 2024. On the grounds of a vast array of medicinal benefits, turmeric has been found to incessantly contribute toward the expansion of sub-verticals in the F&B and healthcare sectors, providing an incredible growth avenue for organic spice market. Ginger is an indispensable ingredient in several global cuisines, on account of its distinctly aromatic and spicy flavor, that helps add depth and heat to food preparations. Besides, ginger is also packed with strong healing properties owing to the presence of gingerol, a bioactive compound with powerful anti-inflammatory and antioxidant properties. As per the Food & Agriculture Organization of the United Nations, most of the fresh ginger is consumed locally in Asia. However, because of rising Asian immigrants, there has been a hike in demand for fresh ginger in Northern America and Western Europe. It is thus prudent to state that the rising consumption of ginger worldwide and its growing popularity in processed food would add impetus to the ginger-based organic spice market in the coming years. In fact, reports claim that the ginger-based organic spice market size would register a CAGR of 6% over 2018-2024. Coriander leaves are often used as an add-on in soups and other dishes to enhance appearance and taste, and coriander seeds are used as the main cooking ingredient in Indian as well as other cuisines. India, as a matter of fact, is the largest producer of coriander seeds in the world and is also the biggest exporter of the same. Coriander possesses promising healing capabilities and can aid in the treatment of joint pain, digestive problems, bronchitis, cough, rheumatism, and inflammation as well. 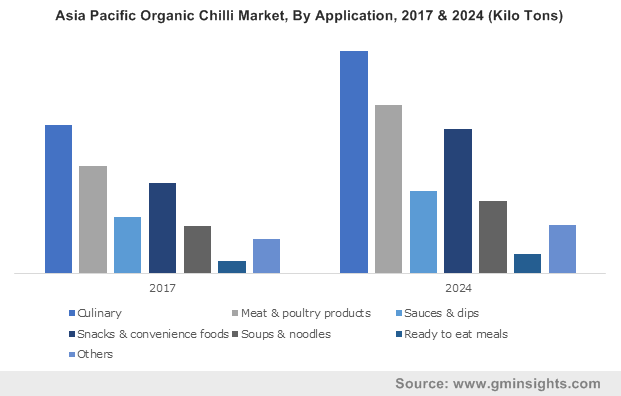 The rising deployment of the spice in culinary applications, not to mention, soups, noodles, and convenience foods, would help escalate the growth of the coriander-based organic spice market. In the coming years, the substantial demand for these spices across myriad geographies worldwide would accelerate the expansion of organic spice market. Driven by their prominent medicinal benefits and flavoring potential, global organic spice market size is expected to cross USD 40 billion by 2024.